The Tremont House Galveston - A Wyndham Historic Hotel In Texas. 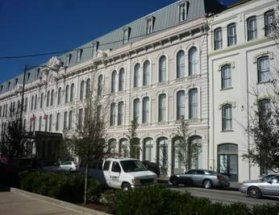 The Tremont House Galveston is the finest of Galveston hotels in the Strand shopping center of Galveston. The European style Wyndham Historic Hotel in Galveston was built in 1879. It is not that big a hotel as the other top resorts but its uniqueness places it among that caliber. The rental rate is quite high especially in spring and summer. Though it is in a busy downtown area the hotel rooms are quiet. Tremont House Galveston exterior looks Victorian but the interior design is very modern with an excellent choice of color. Black and white is very prominent throughout the building. The blend creates a rare unique facility among hotels in the city. It is simply a fascinating interior design. There are over 100 antique shops, museums, galleries and restaurants all around the hotel. Some of the best restaurants are located on the Strand road. Tremont has a nice little restaurant near the lobby area. However there are some other nearby restaurants like The Fisherman's Wharf and Willie G's which provide a lively environment for dining. The Texas Sea port Museum, and the Ocean Star Offshore Energy Center are within walking distance from the hotel. There is also a dolphin Tours center about 10 minutes walk from the hotel. The Tourist trolley drives nearby the hotel. It takes tourists to some attraction sites. It also goes as far as the Galveston seawall and the beach. Want to go on Galveston cruise? The Galveston port is 20 minutes walk from the hotel. 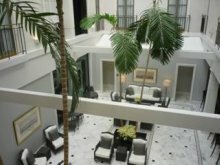 The hotel allows its visitor going on a cruise to park their vehicles at the Hotel Galvez for free. But they have to pay for one night valet parking. Hotel Galvez is another Wyndham hotel along the seawall. The Hotel provides shuttles to and from the cruise port. Tremont is a cute hotel to consider on a travel plan to Galveston. Click here to see more photos on the hotel.